I am fascinated with how other designers, artists and other aesthetes live – do they always live amongst their own work, and only their work, or do they mix it up with other pieces? 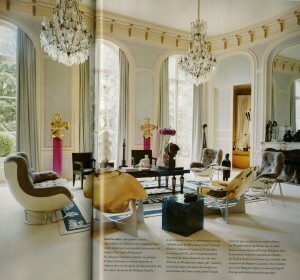 My fascination was recently sated with a spread on Yves Gastou in the October edition of the French Architectural Digest. For those that are not familiar with the name, Gastou is not only a gallerist of 20th Century design; he’s somewhat of an expert having contributed to several books on designers of that era. The photos of his Paris abode affirm for me the theory that I can tell if I’ll like someone by looking at their home (see my previous post on Architect and Gallery BAC owner, Carlos Aparicio) – although I am yet to actually test this theory! The apartment has fantastic bones, which you would expect for something of its age and location. Without even adding the glorious pieces of design that he has, this is a wonderful apartment. I simply cannot sing the praises of good bones enough….but I do digress. Back to the furniture. And the art! The living room could be a gallery unto itself…a dizzying mix of styles that somehow seem to work together. Around the 1950’s rug by Jacques Despierre is a white resin sofa and side chairs from the 1960’s – still upholstered in the original silk velvet, two chairs created by Philippe Hiquily for the decorator Henri Samuel, and a blue resin cube by Marie-Claude de Fouquières. Behind the two 40’s desk chairs by André Arbus are a pair of luminous sculptures by César and Jean-Claude Farhi, and a white marble sculpture by Emile Gilioli. 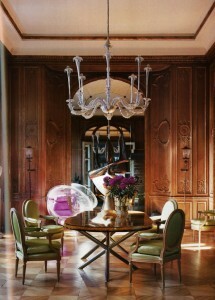 Over in the dining room we have a resin table by Marie-Claude de Fouquières, paired with Louis XVI armchairs. 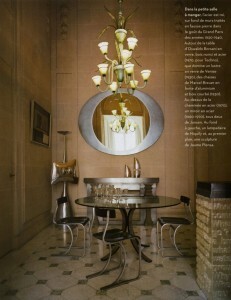 Hanging above is an amazing Venetian glass chandelier by André Arbus. The doors are flanked by a pair of torchères by Poillerat, and in front of the doorway can be seen a sculpture by Philippe Hiquily. In the small dining room (which is still bigger than my only dining room) we have a table by Osvaldo Borsani surrounded by aluminium chairs by Marcel Breuer. The sculpture in the left-hand corner is also by Philippe Hiquily. I’m head over heels for the stunning master bedroom and its original wood paneling. 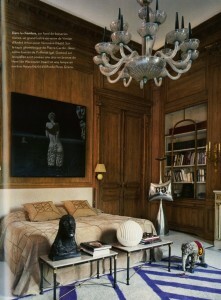 Another André Arbus chandelier hangs above and a carpet by Pierre Cardin lies below the bed. The two tables at the foot of the bed are by Poillerat. I don’t know who painted the masterpiece above the bed so if anyone can shed some light on that I’ll be thrilled…I love it! And last, but definitely not least, the study. This combination of items in here just should not work, but it does here. 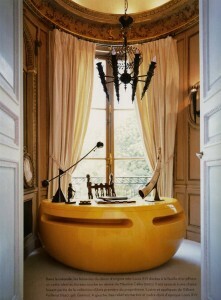 The yellow resin desk is by Maurice Calka (from the 60’s, if you couldn’t guess) and the lights are by Gilbert Poillerat. Gastou’s gallery, located in the heart of Saint-Germain des Prés, was designed by Ettore Sottsass. Galerie Yves Gastou specializes in European decorative arts from the 40’s to the 70’s. I can’t wait for my next trip to the city of lights so I can check it out in person!